You are here: Home / Learn A Musical Instrument / What Is The Best Age To Start Music Lessons For Your Child? Question: What Is The Best Age To Start Music Lessons For Your Child? If you want your child to be musical, it’s best to get them involved with music as early as possible. This can be in terms of having music played to them during their daily activities, or getting them a walk on piano keyboard which gets them used to objects making sounds through touch. Getting your child involved in music at an early age can have a big payoff down the road. We’ve all heard about child prodigies playing complex pieces in Carnegie Hall at the age of six or seven. It’s important to realize though, that those students are the exception rather than the rule. While you can teach your child to become interested in music as soon as they’re born, formal music lessons can generally start from as early as three years old (We’ll look at why this is below). That said, you may not want your child to begin as young as this. 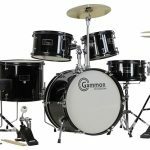 In this article we’re look at a few things you’ll want to bare in mind when deciding what the best age is to start your child on music lessons. Note: This guide is brought to you by Suzy St. George at TakeLessons. Formal music education can start by age 3. By the time your child is 3, the parts of their brain that have to do with music learning have matured. 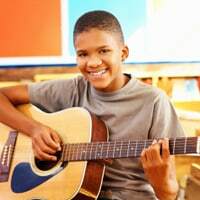 There is even some evidence that suggests starting music lessons that young can help with other neurological development. Music teachers will often have some thoughts on a starting age, as well. For example, some teachers will accept younger children, and others will not. Regardless of age, one of the main things to consider is if the child can sit still and concentrate for longer periods of time. If they can’t, it may be harder for them to get accepted for music lessons. Piano is one of the best instruments to start with. The finger movements for piano aren’t as tricky as the finger movements for other instruments such as a guitar or a violin, and it can be easy to transition into other instruments if piano isn’t enjoyable for your child. There are programs you can use at home to supplement music lessons. There is a number of different videos or online material available to help foster a love of music for kids of any age. These materials can help them learn basic rhythm concepts, how to express themselves, and how to connect positive emotions with music. 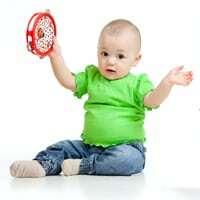 You can introduce musical instruments long before you have your child start lessons. There are some instructors that will take children as young as 2, but they use methods specially designed for toddlers. For example, the Suzuki method involves a specific teaching format and can be used to teach violin at the age of 2 to 3. Parents are required to attend the lessons, and they are involved in learning as well as instruction. Be reasonable about how much your child will master. At a young age, some children can master their instruments very well. Others may have physical or other limitations that can prevent them from meeting their potential. Be reasonable with your expectations, and make sure you’re not placing too much pressure on your child. Consider group lessons for children. These lessons resemble the type of musical education that the child will eventually get in school. If your child already responds positively to peer stimuli, getting her into one of these groups can lay the groundwork for future musical study. Make sure to thoroughly vet your child’s instructor. This is true no matter how old your child is, but if your child is especially young you’ll want to make sure that the instructor has a successful track record with young children. 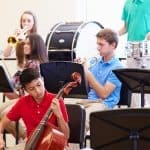 After all, music lessons are expensive, and if lesson time amounts to little more than glorified play time, you can find less expensive ways to do that. No matter who’s teaching your child, you’re responsible for their education, and in this case their music education. Introduce your child to music lessons early, and you’ll help foster that lifelong love of music that’s so important for many of us. 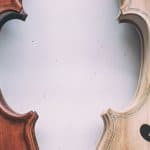 I hope you’ve found this post inspirational, and are ready to start bringing your children to music lessons. If so, please share this guide on your favorite social networking sites so others can also get inspired to start teaching their children music. Suzy St. George is a blog writer at TakeLessons. Since 2006, TakeLessons has helped thousands of students discover their passion through music, by matching them with the top local music teachers across the nation. These music instructors specialize in teaching guitar, piano, singing and more.